Here, folks, is today's sneak peek at a product image from the upcoming Judge Dredd & The Worlds of 2000 AD tabletop RPG. This is a look at the GM screen; at least, the front of it! Limited & Standard Editions Of The Core Rulebook! So, some good news! We've gotten approval from Rebellion to share some more images of Judge Dredd & The Worlds of 2000 AD. (We have some big news about how you get these things coming soon, I promise). I'll be sharing some images over the next few days. Here's your first tantalising glimpse! For those following along, the hardcover core rulebook of the Judge Dredd & The Worlds of 2000 AD official roleplaying game is finished, and we have a shiny copy here at the office. Not long now! Stay tuned, as we'll have some big news soon! Just a few pages from the upcoming book. We have a BIG preview for you today! The first 8 pages of the Judge Dredd & The Worlds of 2000 AD core rulebook, which comprises the Introduction chapter of the game! You can download it as a PDF by clicking on the image below! Remember, the best way to get updates is to sign up to the Judge Dredd & The Worlds of 2000 AD mailing list. We ONLY use that to send you news and previews of the game! Plus you'll get advance notice of the launch plans! This iconic sidearm is issued to every Judge in Mega-City One. 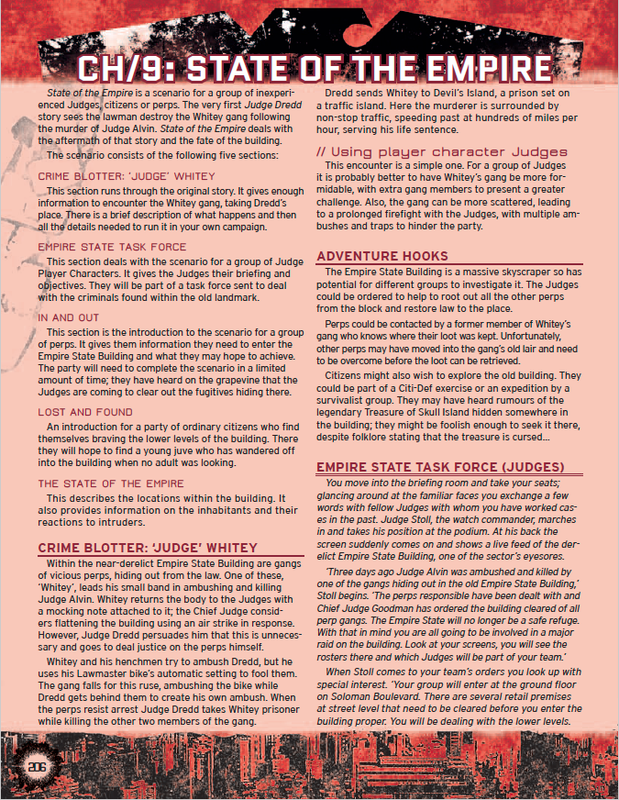 Take a look at how the Lawgiver works in the Judge Dredd & The Worlds of 2000 AD roleplaying game! The iconic bike of the Judges, the Lawmaster motorbike is a formidable piece of equipment. Armed with the Cyclops Laser and bike cannon it provides a Judge with enough firepower to deal with almost any situation. The bike’s computer allows it to run independently, so it can be used as a decoy or even to tackle perps head on while its rider can concentrate on other tasks. It's time for another look at the upcoming core rulebook - in particular, a map of the Empire State Building from the introductory adventure "State of the Empire"! 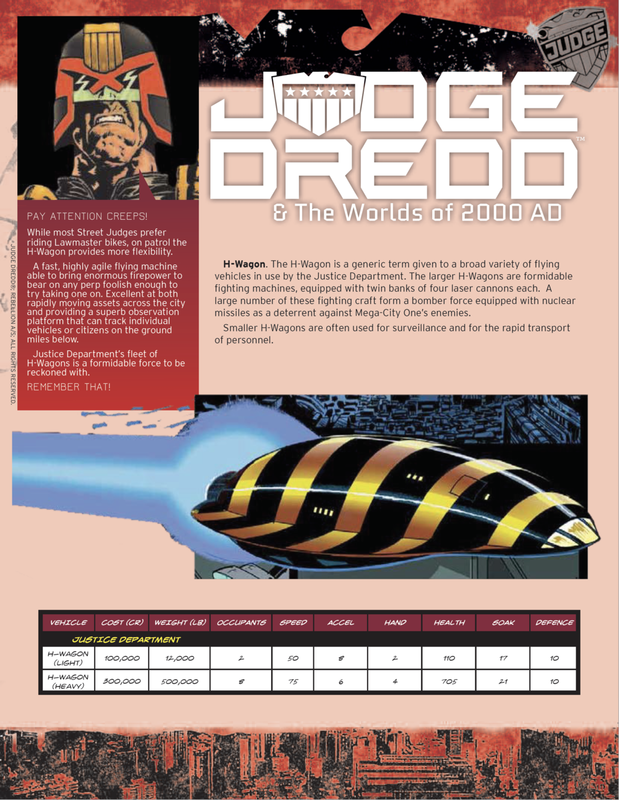 It's time for another preview directly from the Judge Dredd & The Worlds of 2000 AD core rulebook! We take another look at the included introductory adventure, State of the Empire, with the Toad in the Hole, a critter living below the building. State of the Empire: Preview of a Judge Dredd Adventure! Chapter 9 of Judge Dredd & The Worlds of 2000 AD contains an introductory adventure which can be played out differently by Judge, Perp, or Civilian characters. Here's a quick look at the first two pages of that adventure! We'll be sharing more of it soon. Be sure to sign up to the 2000 AD RPG mailing list for the latest alerts! In other news, we'll be accepting applications for GMs to demo this adventure (and the game) at conventions very soon. Those GMs will get an advance electronic copy of the book to use for demonstration purposes. Keep an eye out for news on that! Powerful. Versatile. Deadly. It's the Lawgiver! The Lawgiver is the iconic sidearm of a Judge in Mega-City One. Patrol From The Skies In An H-Wagon! In 2000 AD, a variety of vehicles are available, from the Judges' Lawmasters to today's preview, the airborne H-Wagon! Judge Dredd & The Worlds of 2000AD provides a wide variety of career options for Judges. Med Judges, Tek Judges, Psi Judges, the Wally Squad, Riot Squad, SJS, even Space Corps and Holocaust Judges, and many Judges will take more than one different Judge career during their lifetime. One of these many careers is the Street Judge! This is a big image, so click on it to enlarge! The second preview of the Judge Dredd & The Worlds of 2000 AD Tabletop Adventure Game features a civilan career: the Skysurfer! To keep up-to-date on the latest news, be sure to sign up to our mailing list!